Cherries, tiny, sweet & yummy and oh so delicious. These little fruits are packing a lot of important nutrients. Just 1 cup of raw, pitted cherries offers up 20 mg of calcium! Cherries are a super food and are super healthy and nutritious for your little one. With a wonderful color to capture baby’s attention, cherries are sure to be a hit with baby’s eyes and taste buds. 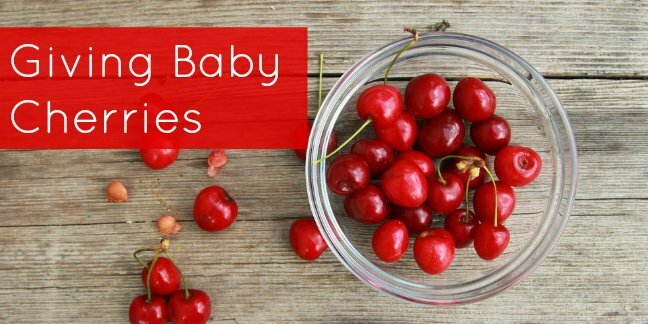 When can I introduce Cherries to my baby? Babies may begin to eat Cherries from about 8 months of age or sooner with the ok of your pediatrician. Cherries are not highly allergenic however cherries do contain pits and a rather thick skin. Young babies may not be able to properly digest cherries earlier than 8 months of age and if you wish to add them to baby food earlier, do be sure to thoroughly blend them! YAY! According to the EWG, cherries have dropped off the “dirty dozen” list of foods that are most highly contaminated with pesticides – purchasing organic is a personal choice. Cherries are very delicate. Always inspect cherries prior to purchasing them; little indents and dull skins may be be signs of the beginning stages of rotting. Cherries should be bright, smooth, unblemished and shiny. The rule of thumb is the darker the cherry, the sweeter the taste. Cherries need to be stored in the refrigerator. They are very sensitive to temperature changes. You may freeze cherries but they must be pitted first. Un pitted cherries take on a flavor like almond when frozen. You may freeze them cut in half, diced or stewed. As with any other fruit, the fruit may remain in the freezer longer if it is frozen in it’s near original state. Freezing changes the cellular structure of fruits as does cutting peeling etc. Frozen whole or halved cherries will last longer than stewed or diced cherries. Best Way to Prepare Cherries for Baby Food? Pit cherries by inserting the tip of a vegetable peeler in the stem-end of the fruit; rotate around the pit and scoop it out. You may then cut the cherries into small dices or blend them up in a food processor or blender. Be sure to carefully watch your older baby when offering cherries as finger food. You may want to squish the cherry dices to help baby mash and chew the cherries. Cherries may be stewed by adding them to a saucepan and then simmering them in a bit of water or you can simply whizz them up raw, just be sure to thoroughly cleanse them! Step 1: Wash, clean and pit the cherries. Be sure to remove the stems. Step 2: Drop the cherries into a saucepan with 1 cup of water. Step 3: Bring to a boil and simmer for about 20 minutes or until the juices run freely and the cherries become soft. Step 4: Allow to cool and then puree in a blender or food processor. Step 4: Puree or mash as needed for your baby and please, don’t eat this all before your baby gets a chance to taste it! Step 1: Mix oatmeal and cherry puree together. Step 1: Combine all ingredients in a blender or food processor. Blend or process only until a thick consistency is created. Step 2: Add extra wheat germ for even more cling. Step 2: Transfer to a blender or food processor. Puree or chop as needed for your baby’s age and texture requirements. This makes a great finger food snack. Step 1: In a glass bowl, warm the cherries in the microwave for about 30 seconds. Step 2: Wizz the cherries in a blender until smooth and juicy. Step 3: Drizzle the cherries over cottage cheese and serve. If needed, mash the curds to a texture/size your baby can tolerate. This makes a quick and easy finger food full of antioxidants, protein and calcium. You can also offer baby her own bowl and hand her a spoon; this will cling to the spoon and is a good food for self-feeding practice. Step 2: In a glass bowl, warm the cherries in the microwave for about 30 seconds and then squish cherries with a fork. Step 3: Stir the cherries into the quinoa and add 3 tablespoons of mashed sweet potato. Serve warm. Very colorful and very nutritious. When feeding your baby cherries, please be sure the skins are pureed enough, or chopped enough so that no choking hazards will exist!